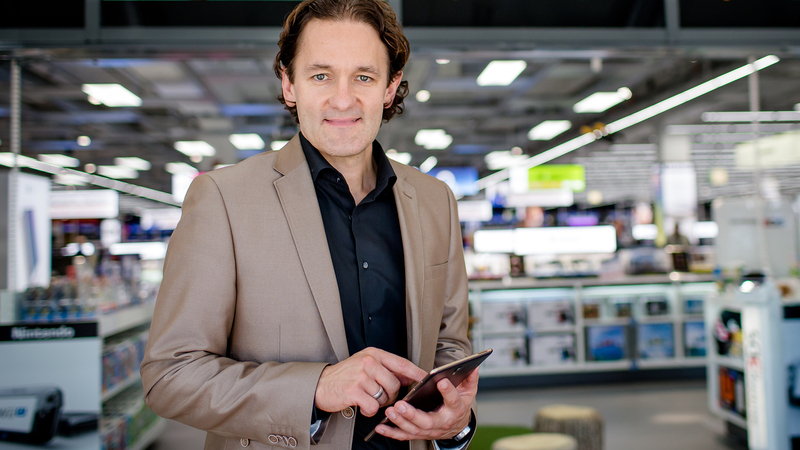 Digitization in Retail, a book written by Martin Wild, Chief Innovation Officer of the MediaMarktSaturn Retail Group, and Marc Knoppe, professor of International retail management at Ingolstadt University of Applied Sciences, has just been published. Ingolstadt, 27.09.2018: Retail is set to fundamentally change in the digital world. What this means for the retail sector, retailers and business models is discussed by Martin Wild and Marc Knoppe in their new book Digitization in Retail: Business Models, Trends and Best Practice. Both experts have years of retail experience. When he was still a teenager, Martin Wild founded Home of Hardware (hoh.de), which later grew into a leading consumer electronics online shop in Germany. Since 2011, he has been instrumental in turning MediaMarktSaturn from a late starter into a retail pioneer in the digital world. In 2017, he was included in Handelsblatt’s list of the 100 smartest people in Germany. Marc Knoppe is professor of international retail management at the THI Business School at Ingolstadt University of Applied Sciences, the book’s publisher. Since 2009, he has played a crucial role in the internationalization and further development of both the commerce degree programmes and the THI Business School itself. He conducts research alongside international retailers and brand-name companies as well as foreign universities in the field of customer experience, consumer behaviour and digitalization strategies in retail for a successful future. The retail sector is currently one of the industries most affected by digitalization. Traditional business models are being transformed from the ground up by disruptive business models, changing customer behaviour, and new distribution channels and competitors. Against this background, the authors assess from different angles how retailers can set the right strategic course and harness the possibilities of digitalization to improve the customer experience. Proven experts highlight the opportunities and risks of digitalization for businesses and provide readers with valuable tips for the further development of their own digitalization strategy. The authors’ experience is incorporated into descriptions of successful examples, pragmatic ideas and the presentation of empirical research findings. The book is published by Springer Gabler. In his article ‘Seamless Shopping’, Martin explains MediaMarktSaturn’s strategy, in which bricks-and-mortar retail and online commerce are regarded not as competitors but instead as a mutually beneficial system. Wild puts the concept of “Think like a startup: try fast, fail fast and adjust even faster” at the heart of his innovation strategy. When implementing new concepts, MediaMarktSaturn backs swift, local action. Instead of taking a big leap with far-reaching consequences after intensive planning, only for it to turn out a failure, MediaMarktSaturn acts according to the proof of concept principle: it rapidly implements digital innovations and tests their advantages and disadvantages in a retail setting. What counts at the end of the day isn’t the possible success or failure of a single innovation, but customer value. By employing this basic approach, over the past few years MediaMarktSaturn has developed from a late starter into a pioneer of digitalization in the retail industry. Using practical examples, Wild describes how store navigation, augmented reality glasses and cashierless shopping have the potential to change physical retail, too, in the digital age. In his article ‘Customer Experience and Digital Innovations as Drivers of Successful Business Models’, Prof. Marc Knoppe addresses the omnichannel approach. According to Prof. Knoppe, successful business models in domestic and international retail are based on an omnichannel strategy which allows customers to seamlessly move between distribution and communication channels. Leading retailers have recognized that the remedy isn’t technology or digital innovation per se, but an omnichannel strategy focusing on the customer experience, customer value and the customer’s perspective. This strategic view is the key success factor in the use of digital innovation coupled with higher profit. Martin Wild has been Chief Innovation Officer (CINO) of the MediaMarktSaturn Retail Group since January 2018. In this role, he heads the group-wide innovation strategy and its implementation. Previously, he was the group’s Chief Digital Officer. One of the pioneers of digital retail, at the age of eighteen he founded the online electronics store Home of Hardware (hoh.de) in 1997, selling it a decade later to Premiere (now Sky Germany) after growing it into one of Germany’s biggest consumer electronics online shops. He joined the management of MediaMarktSaturn in 2011. As Vice President Multichannel, he handled the launch of saturn.de, his subsequent positions including CEO of redcoon. In 2017, he was named one of Germany’s brightest minds by business weekly Handelsblatt. Whenever robots make deliveries, customers are guided through Saturn using augmented reality, or the retail sector is shaken up by innovative startups and established retailers working together in the Retailtech Hub accelerator, Martin Wild and his team are usually responsible! Prof. Marc Knoppe is the professor of international retail management, strategic marketing and innovation management at the THI Business School at Ingolstadt University of Applied Sciences. He is the director of the master’s programmes in Retail and Consumer Management as well as Security & Safety Management. Prof. Knoppe has over twenty years of international management experience as a CEO and board member of American and German companies working in retail, consumer services and B2B services, where he has focused on corporate strategy, marketing and sales. A member of the board of the European Institute of Management (EuWiM AG), Prof. Knoppe is also a founding member of the German Retail Lab and sits on various advisory boards.